The Mespil Hotel is a modern and stylish contemporary hotel. It offers excellent accommodation, good food and drink and two conference rooms, each of which can accommodate up to twenty-five delegates. It is located in exclusive Ballsbridge, on the Grand Canal at Baggott Street Bridge, and is under five minutes walk from the city centre. The guestrooms at the Mespil are bright, spacious and modern and have been tastefully decorated using natural restful colour schemes. To ensure maximum comfort, all 255 bedrooms feature modem connection, hairdryer, cable TV and tea/coffee.To accommodate individual guest requirements the Mespil Hotel offer smoking/non-smoking, family & disabled rooms. Breakfast and dinner are served in the Glaze restaurant. The Head Chef, Shane Loughlin, has put together an exciting and creative menu to tantalise even the most discerning of taste buds. The hotel is also home to the Terrace Bar which serves carvery lunches on Monday to Friday, and bar food in the afternoon. There is a calm and relaxing atmosphere in the Terrace Bar and it offers guests the ideal venue in which to relax and unwind after a hectic day. 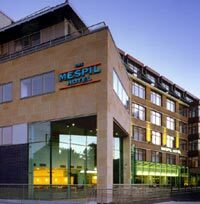 The Mespil Hotel is located in exclusive Ballsbridge, on the Grand Canal at Baggott Street Bridge, just ten minutes walk from St. Stephens Green and Grafton Street. The hotel is also located within close proximity of The National Gallery, Government Buildings, and many other visitor attractions.